Dedidicated To The 2016 Summer Olympics. The pink casket. That is the first and last thing I’ll take with me. People Magazine. I recognized the letter head right away. Tiffany Lamp, the name I read quickly was of a Christy Henrich. Never heard of her I said within. The Funeral appeared early, devastating. A copy of Little Girls in Pretty Boxes by Joan Ryan landed on my desk, the name Christy Henrich appeared once again. I was startled as if a ghost knocked on my conscious. There she was. Her story from almost Olympian to death by Anorexia-Nervosa. I read the novel unbiased, in control, and with quiet sadness. She had a severe leg injury(broken left leg in 1979), and she was still ordered to perfom. *She passed away in 2006 at the age of forty-six from complications of being a Quadriplegic. Elena Mukhina at her athletic finest. A promising young U.S Olympian. *The Doctors in Japan accidentally disconnected her breathing tube. 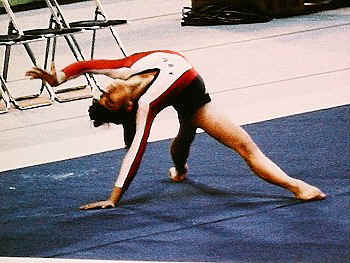 Julissa Gomez passed away in 1991. 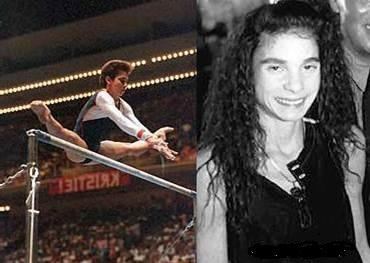 In 1988, a Judge told her she was fat and would never make the Olympics. She missed the 1989 Summer Olympics by literally a fraction of a point. That was what become of Christy. She was only forty-six pounds when she passed. I hear these little girls saying please, don’t break me, don’t throw me away. *There are many more tales in Ryan’s novel. How heartbreaking to know these girls were just commodity, political chess pieces for gold medals. The people responsible: Coaches, Judges, Manufacturers, should be charged with MURDER. Twelve years ago, that could have been me. *I’m in full recovery from a twelve year battle with Anorexia-Nervosa, including time at an Outpatient Program and Years of Transpersonal Therapy. By worldprosechronicles in Uncategorized on August 3, 2016 .